Pro-Park-8-Standard 4 Post Lift - Derek Weaver Co., Inc.
Best Seller! Warehouse pick up price Now ($2499.00). The Direct-Lift® Pro-Park 8 Standard (Model PP8SPY11) Four Post Automotive Lift is America’s #1 Enthusiast Car Lift. The Direct-Lift® brand has sold over 100,000 lifts to the enthusiast market and is part of the worlds largest lift manufacturer (Dover Corp.). Direct-Lift® is the official lift of the Barrett-Jackson Collector Car Auctions. Has the lift been "tested and certified" by ETL to the rigid USA lift standards? All of the Pro-Park Series lifts have been tested and validated as "Certified" by the nationally recognized ETL testing lab to meet or exceed the current USA ALI/ETL standards. Is the manufacturer known and where is it made? Most lifts sold to compete with the Direct-Lift® Pro-Park Series are imports that are being brought in from unknown manufacturers at slightly lower prices. These companies do not conform to the USA lifting standards and therefore guess at rated capacities. It is unknown whether these companies are even insured in the USA (it should be vital that you ask these questions). All Direct-Lift® models are owned and manufactured by the Fortune 300 Dover Corp.'s Vehicle Service Group (NYSE:DOV) based here in the USA. VSG/Dover has ISO-certified manufacturing plants worldwide to compete in the global market. VSG/Dover is the largest lift manufacturer in the world and also owns the Rotary® Lift, Forward® Lift, and Revolution Lift brands. You simply cannot buy from a more stable and reliable company based here and insured here in the USA. What is the warranty and availability of parts? All of our Direct-Lift® models carry a 5 year parts warranty and a 1 year warranty on the power unit and hydraulic cylinder. Parts are inventoried here at our warehouse with a large, multi-million dollar backup at the Direct-Lift® headquarters in Madison, Indiana. Our headquarters owns and utilizes an automated 7 Tower REMSTAR inventory management and parts distribution system with a 99.5% accuracy. This large investment is unmatched in the lift industry and rivals many systems used by the car companies. Shipments are made daily in a very timely fashion. Most parts orders are shipped within 24 hours of order. Rest assured, no other lift company comes close to this level of commitment to customer service. The Pro-Park 8 Standard 4 Post Lift includes the same commercial style "Double Lock Ladder Leveling System" and secondary backup safety locks as used on our commercial grade Pro-Park 8 Plus, Pro-Park 9 and Pro-14 Lift models. This NEW STYLE Pro-Park 8 Standard auto lift also has a lifting height of 72" and clears 68" under the runway. The Direct-Lift® Pro-Park 8 Standard has the ability to level your runways while in the locked position. Only the Revolution Lift by Rotary® Lift Consolidated offers this same leveling and locking capability and has the same style backup secondary safety lock system. 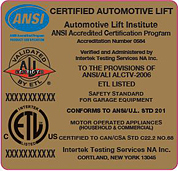 All other lifts on the market, including Backyard Buddy, Complete Hydraulics, Danmar, Atlas, AutoLift and others do not provide for leveling the lift while resting in the locked position NOR are they Certified to the rigid OSHA recognized ANSI/ALI ALCTV-2017 automotive lift standards. To validate this claim, ALI requires the lift to be 3rd party tested by the nationally recognized ETL testing lab and engineers. All of our Pro-Park Models have passed this validation process and earned the right to wear the certification label pictured above. "The Double Lock Ladder Safety System" on the Pro-Park 8 Standard four post lift allows you to level the lift to an unlevel floor while being in the locked position. Our competitors are not capable of being level on an unlevel floor while in the locked position which is how you use any car lift correctly. They can only be locked in lock positions that are not adjustable which leaves your vehicle locked only as level as your floor (assuming their lock positions were welded or cutout accurately). The Pro-Park 8 Standard not only solves the problem of leveling but also has a unique backup secondary lock. Should a cable go into a slack condition for any reason, the secondary lock will engage automatically. The Pro-Park 8 Standard gives you all the features of our high-end commercial 4-post lifts at a very special Direct price. Included with the Pro-Park 8 Standard car lift are a Free Caster Kit with Poly Casters, (4) Free Drip Trays , Free Jack Tray and (2) Free Wheel Stops. An optional Pro-Jack is also available to provide wheels free service. The typical installation time is approximately 4-5 hours. The Pro-Park 8 Standard is manufactured by Direct-Lift and is backed by a 5 year parts warranty and a 1 year warranty for the hydraulic power unit/cylinder system. Direct-Lift® is a Vehicle Service Group company which is a subsidiary of the Fortune 500 Dover Corporation (NYSE:DOV) which is the Largest motorcycle/auto/truck lift manufacturer in the world. Customer service and support after the sale is the best in the business. For a limited time, get your choice of Weaver Graphics Lift Decal set included. Choose between Flames or Pinstripes when ordering. 9 Locking Positions (under runway) 20", 26", 32", 38", 44", 50", 56", 62" & 68"
Question: How much ceiling height clearance will I need to stack my cars? Answer: Add the height of your vehicles together, then add 7" to that total. Note: The maximum bottom vehicle height is 79.00" for the Pro Park 8 Plus and the Pro Park 9 Plus. The Pro Park 8 Standard would be 67.00". H - Runway Height: 4.5"
The Direct-Lift® Pro-Park 8 Standard is proudly manufactured by Dover Corp.'s Vehicle Service Group (VSG). VSG comprises nine major vehicle lifting and collision repair brands: Rotary® Lift, Chief® Automotive Technologies, Forward® Lift, Direct-Lift®, Hanmecson®, Revolution® Lift, Elektron, Blitz® and nogra®. Based in Madison, Ind., VSG has operations worldwide, including ISO 9001-certified manufacturing centers in the U.S., Europe and Asia. Very nice quality and a good value for the money. My decision was based on fellow club members. There must be a dozen of these lifts in the area. Myself and one and a half friends unpacked and assembled it in less than six hours. A complete joy to work on a car at comfortable levels. No more dirt in my eyes or long hair caught by creeper wheels! An added bonus is having the floor space underneath while the car is idle. This leaves room for a second car should the day come. Had this installed, this lift does everything I need the lift to do, especially like that it comes with everything, but the re position bracket, which was well worth it for my application. Great product. Great product! Best one for my needs. Good quality and the right size for my low ceiling (9'5") garage. I paid a company to install it and it was money well spent. Not worth risking a back injury and they gave me some good times on using/maintaining it. Only had it set up a couple weeks. So far...so good! SHOULD HAVE DONE THIS YEARS AGO ! I have looked at many lifts over the past year. Direct Lift has more lift for the money by far I will be adding another this spring. Two people knowing what they were doing set it up and checked me out in under three hrs., using hand tools and a portable crane ie. engine puller. I received my Pro-Park 8 Standard Lift about 3 weeks ago and installed it myself with the help of my tractor/front end loader. Took 1 day to assemble then made necessary adjustments the second day. Undoubtedly one of the best shop purchases I've ever made. The lift is perfect for my shop and makes my restoration work easier and safer. I have showed it off to my friends and they all are amazed at how well it is made and operates. The certification of this lift was the most important selling point for me and the fact that it works with my 10' ceiling height. Thanks Derek Weaver for excellent service and this product. I put it together by myself. It only took a few hours. The instruction leave a little to be desired. If you do just as it says and look up the part numbers, everything is correct. I would recommend in it to any one looking for a lift. Just got this put up and it works great. Very solid construction and very stable. I had to shim the posts to get level because my floor has a slope with a drain. But after shimming and getting level, its very solid. Instructions could be better, you have to read through them a couple of times and also refer to the schematics. The lift is a 5, but I marked it a 4 because of the directions. I had a drip damaged and they sent a new one no questions asked. Definitely would recommend this lift. It took 4 guys about 5 hours to assemble. About half the time was spent reading and confirming all directions. The directions were a bit hard to follow (yet workable) and a good re-write could assist others. Overall, everything went smoothly and it is in place and in use. To this point, the unit has met my expectation. I purchased this lift to allow me easier access when working on my 65 Shelby Cobra. The car is very low to the ground and normal maintenance was an issue, not any more. I had several repairs and maintenance tasks to perform and this made the work easier and so much faster. It is also much safer than driving up ramps just to get a jack under the car, then jack stands, and still being cramped. The lift also makes getting other things, like my riding mower, in and out of the garage so much easier. I am kicking myself for waiting so long to get a proper lift. Turned two car garage into three car garage! The lift is as advertised. You definitely need several strong backs or hoisting device to position runways on crossbars. Be sure to pay close attention to the detailed instructions for leveling and setting the locking mechanism or you will have to repeat steps. You can adjust the heights of the locking mechanism if you have a tight fit which was a bonus. My 1970 LeMans &2015 Mustang GT fit perfectly! I conversed with Derek Weaver several times inquiring about the Pro Park 8. They were very helpful with my numerous questions on shipping etc. I did a lot of research prior to choosing which lift I was going to purchase and it came down to price and certification. I have a 68' Camaro & 65' AC Cobra 427 Replica that were going to share a garage. I wanted a lift that was redundant on safety and able to give me peace of mind. This one gave me both. I ordered online and lift arrived at freight company in two days. This thing is heavy so a two axle trailer that is at least 18' long is recommended. I got it home and together in about 5 hours. I needed help lifting the runways onto the cross members which required 3 other guys to help. My wife even came out to help lift parts into place. I had one warranty issue, one of the cables had frays in it, I made a claim with pictures & within days a new cable arrived at my home. That is called service. This thing is built very sturdy, I Love my new lift and am extremely happy. For 1/10th the cost of building on to my garage I got the solution I needed and it's fun to play with too!! I purchased a ProPark lift from Derek several years back and when it came time to sell the house, the lift was leverage for the buyer so I had to let it go. I promised myself I would order another one as soon as my new place was ready, so I did. This version has the revised ability to level the lift while the floor is not which is great. I love this lift and plan to never let this one get away. I highly recommend Derek and DirectLift to any and everyone. The lady I ordered my lift from was very knowledgeable and very helpful. She even recommended a local company to assemble the lift. I could have probably assembled it but the two men who assembled it were accustomed to assembling this lift and it still took the two of them almost six hours. Plus they had the equipment to handle the heavy parts. I am very satisfied with this lift. I have a 11 ft ceiling in my workshop and had to raise my garage door opener and change the slope of the rails on one of my garage doors which probably took about an hour. I can now raise the car on top to within about 6" of the garage door raill. This gives me plenty of room for the car parked on the bottom. I'm actually looking forward to changing the oil in one of my cars. I won't have to jack them up and roll under the front end to change the oil. I received my lift about two business days after ordering. Which tells me the lift was probably shipped out the day I ordered it. The lift is comprised of superior quality material. I was amazed at how well everything fit. Outside of figuring out how to move the components into position, putting it together was a breeze. I did have to take apart and redo one end because the instructions don't tell you how things should be oriented. Overall, very happy. This lift met all expectations and works great. Easy assembly even with directions that could be improved. It is saving me about $150 a month since I no longer pay to store one of my classic Mustangs. I can now clean the underside of my vehicles without a "creeper". Delivery was fast and Derek Weaver representatives were very helpful. No hype here. Quality construction and materials. Competitive pricing. I shopped a lot of lifts, wanted a certified lift. Derek Weaver Co. has the best. Pick up from warehouse in NC and istalled it myself with my engine hoist. Could not be happier or more satisfied. Best deal on a Certified 4 post lift. After doing lots of homework, I decided that I wanted the Pro Park 8 Standard. It was my good fortune to live near the Derek Weaver warehouse so I was able to examine it closely and see it in operation. I purchased it soon thereafter and arranged to have a third party deliver and set up the lift. The setup went fairly smoothly and overall I am very happy with the lift. It is sturdy and appears to be of quality construction. The only reason I give it 4 stars instead of 5 is that the lift had a number of scratches incurred during shipping and a couple of missing bolts. I do not fault Derek Weaver Co. for this. This was the responsibility of the manufacturer, not the distributor. To their credit, both Derek and Carol were very responsive to my needs. They promptly contacted Direct Lift and had the bolts, touch-up paint, and some replacement decals (also damaged in shipping) dropped-shipped to me in a timely manner. I strongly recommend Derek Weaver Co. for any sort of car lift needs you have. They are honest and straightforward and keenly interested in customer service. Side note: I purchased a bracket that allows you to mount the pump motor and reservoir on the front side of the left front post instead of the side of the post. Depending on your garage space and configuration, this is a very good and relatively cheap upgrade. We gained almost a foot of additional clearance between the two cars on the "ground floor" of our garage. My installation is in a standard sized bay with a ceiling height of just over 9 feet. The DirectLift product is clearly the best of the available options. Although smaller in size and capacity it has construction quality, functionality and safety features typically found only in larger lifts. Add in the very reasonable price and it is an excellent solution for most hobbyist and restorers. Ordered the PP8S on a Wednesday, arrived on Friday. Instructions need a bit of improvement, but was able to read through it. Cables already routed through the pulleys from the piston end but cable ends will not pass through the ramps unless you remove pulleys. Really appreciate Doug's help with selection and shipping. I was so impressed with the fast delivery 3 days and it came in packed nice and neat with all parts there. Excellent Lift! Awesome Price! Best Deal Out There! Great staff! They expedite your order and get you the best shipping price they can, even if it entails extra time on their part! We love our lift and have shared our experience with our customers and friends of whom some purchased one of their own from Derek Weaver too! It is the best quality for the best price out there! I did months of research to find a certified lift. Easy assembly! They are the best hands down! Nice lift at a fair price. It's simple design went together fairly easy with no surprises. About 5.5 hours to do it. It works the way it's supposed to and I couldn't be happier. Way to go "Direct Lift!" Direct-Lift clearly offers the most bang for the buck, and is the only lift that I could find with an ALI certification. I had it professionally installed, and the crew said it was built much better than any they have seen in the price range of this lift. It’s working flawlessly, and I can easily park my daily driver under my 1961 Buick Electra with only a 10.5ft ceiling. I ordered it on Monday, it arrived in KC on Wednesday! This is a great storage lift. It handles all you throw ay it and then some. The quality and workmanship is far above all other cheap chinese knock-offs. With all the cheap knock-offs all the welds were different and I have heard horror stories about the locks on them. Can't go wrong with a Weaver/Rotary Lift, may be alittle more money....but you get what you pay for. With 3500lbs of $80K car up in the air I'm not going to sleep well if I went cheap just to save a couple $$ bucks. All the other reviews on this site sound like paid professional reviewers. This one is not. After the house burned down I rebuilt it with a garage ceiling high enough to fit one of these things. Did the typical internet research, read Hemmings, talked to some other car guys, and decided this was the best product for the money. Found out these guys are located fairly close to me, so I figured if I had any problems I could just stop by their shop. Even though made in China, the quality of the product appears good, and I've had no problems after several months of home-garage type use. In retrospect I should have purchased the taller version since it's gets old having to duck every time I move around under it. The 3rd party installer did a good job, arrived on time, did the work without tearing up anything, cleaned up, and left. That's the way is should be done. I would recommend this product and the installer recommended by Weaver. This is a great lift. From the great customer service to installation and use, this has been a great experience. After researching several different lifts I choose the PROPARK 8 and I am so glad that I did. This lift does everything promised and fits great in my garage. I have two Pro Park 8 lifts, and I couldn't be happier. Good quality and they work great. I am 6'2" and I can fully stand up when working on the car while it is on the lift. I purchased them more for storage but have used them for more maintenance and repairs than I thought I would. I recommend the lifts highly. You can't beat the value of this Direct Lift from Derek Weaver. They are super people to work with and so helpful. You will wonder how you ever built a car without it! The Pro-Park Lift is awesome. It is very affordable and don't even think about doing auto restoration without one. We recently purchased a 1967 GTO and we would have been lost without the lift. It makes life so much easier to do restorations. Pleasant to deal with over phone, they set up the install with a 3rd party-- nothing for me to worry about. Guys delivered on time and setup in hours. No problems at all with this lift. Have recommended.